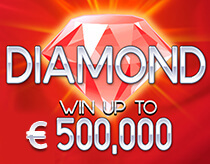 Play in the lap of luxury with Diamond Red! Reveal 9 prize amounts hidden behind the 9 diamonds and match three to win. If you find a diamond ring, you win the bonus prize! Indulge in the richness of these dazzling diamonds and see if you can strike it rich!